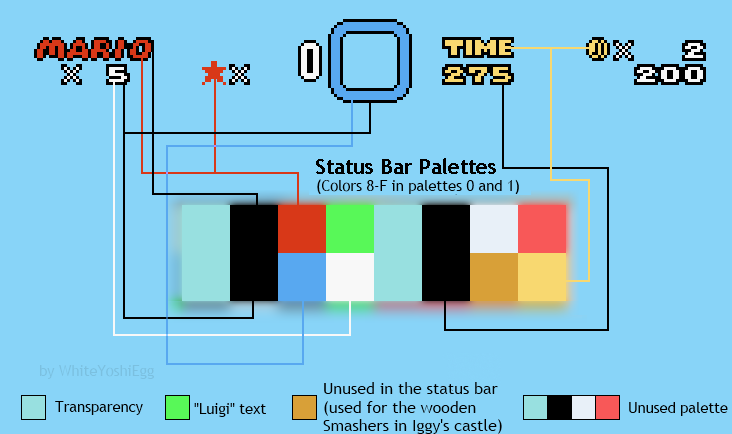 Description: This tool makes it easier to edit the Mario/Luigi Start screen. Good if your main character isn't Mario or Luigi. If you encounter an issue where glitchy tiles show up or tiles appear to be missing, read the readme before asking for help. It is likely that you forgot to install the Row Patch. You have to extract the bin files from your ROM. You can do this by pressing the red colored mushroom in Lunar Magic. A folder called "Graphics" should appear in your ROMs directory where you can find the bin files. If it only creates a file called "AllGFX.bin" then make sure to disable "Options>General Options>[ROM Editing Options]>Use Joined GFX Files" and try again. Good user interface. Using the preview provided it looks like an easy to use editor... but I cannot find the BIN files. You can put that somewhere in template.asm if you want it applied automatically as well. Your rom most likely has a .sfc extension. The tool will not show them or handle actual .sfc roms correctly. Note though, that unless you didn't edit your rom in LM yet, or for some reason disabled the option to add a header, the rom is actually a headered ROM (.smc) that's marked as unheadered (.sfc) which can easily break tools most notable asar. If you want your .sfc rom to show up you can change the filter by typing "*.sfc" (or *. * for all filetypes) into the filename field. Though again, if it's actually an unheadered rom then the tool will most likely break something. It's safer to generate a patch and apply that using asar, that one will tell you if something's fishy. Thank you biob I just used this and it worked!!!! I don't think Lunar Magic fully supports all stars. Dunno if this tool supports it either and I have never used it so I can't help you there, sorry. When i select the rom in lunar magic (i selected all stars) and it says wrong name or wrong format. How do i fix it? 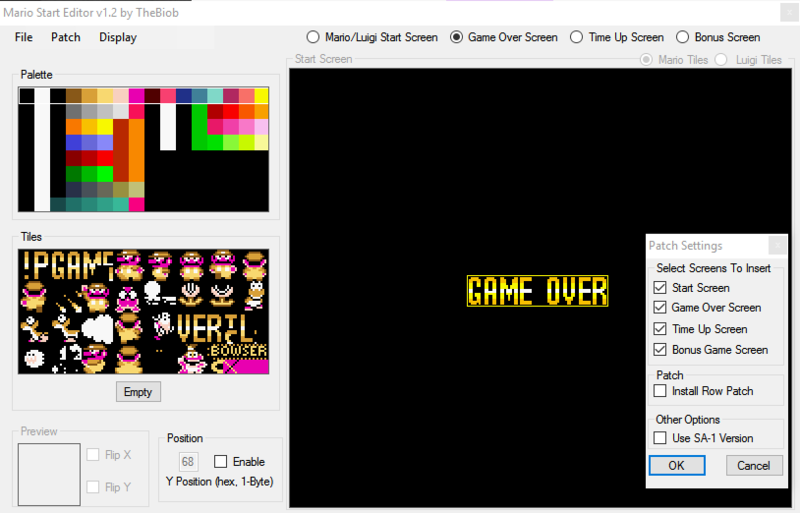 Do the same with GFX10.bin, after you did that the window should appear with the "Mario Start" screen. "Patch ROM Directly" means that it inserts the changes directly into your ROM without generating a patch that you insert with asar first. Im confused, i dont know how i start, i only get a grid, no tiles and i cant add, what does "Direct Patch" do?????? Do you mean it won't show in-game or in-editor? In case of it not showing in-game are you sure you selected the screens in the patch settings? Also, are you using SA-1 or not? Either way you can send me the patch it generated and I'll look at what's going on. In case of it not showing in-editor you can try loading a screen from rom or from the template file. If it doesn't work you can send me a patch of the rom it failed to load from so I can see what's going on there. mine wont show the tiles for start and game over can you help? Open the palette editor, uncheck "Enable custom palette for this level" and edit the palette there. I do not know if lunar magic changes that. If you want to change the palette the tool uses then export your palette and open it via "File > Load Palette"
How can I change the pallete of the text? I added a bit about the row fix patch in the description because I can see people tripping over that and PMing you about it (people don't like reading readmes). Hope that's okay.